The report collates a variety of metrics and – taken together – provide a unique and up-tothe minute read on the state of the tourism industry in RTO 12. Tourism is a vital part of the region’s economy, and accounts for almost 10% of its GDP, and 13% of its total employment. This report is provided as a service to our operators and other stakeholders and is intended to give insight into the general health of the industry. Index numbers are a statistician’s way of expressing the difference between two measurements by designating one number as the “base”, giving it the value 100 and then expressing the second number as a percentage of the first. Indexes allow us to compare trends across different business metrics, such as HST, room occupancy, golf rounds and entries at attractions. In two respects, F2016 was a repeat of F2015. Despite rebounding from its 5-year low, a weak Loonie in 2016 helped drive strong international and intra and interprovincial tourism. And a warm summer and fall contributed to excellent results for accommodation, golf and park operators. As was the case last year, the weak dollar overnight closest to the US border, which saw a considerable increase in American visitors. Canada logged a 9% increase in international travellers, while Toronto also recorded strong growth. RTO 12 benefitted from the dollar primarily because it kept Canadians from travelling to the US. 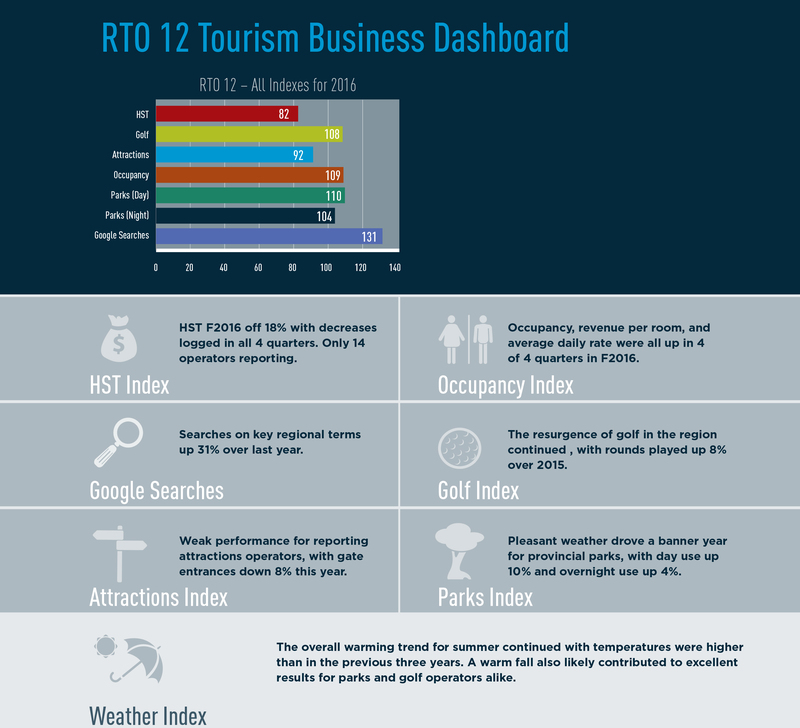 With so many of RTO 12’s key tourism activities focused on outdoor activities, weather has a significant impact on tourism businesses in the region. The summer of 2016 was the warmest in four years, which encouraged visitation. Similarly, a traditionally cold Canadian winter – at least at the beginning of the season – helped drive strong results in Q4. Unlike 2015, occupancy was only up slightly during the summer, but the sector rallied during the fall and winter. Accommodation operators saw increases in occupancy during all four quarters of 2015, finishing the year up an outstanding 8.5%, versus 3.5% for Ontario overall. 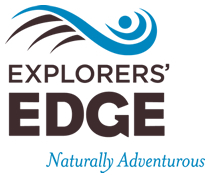 Similarly, regional provincial parks had a strong year, welcoming 4% more day use visitors and10% more overnight visitors. Some of our data points show contrary results. HST receipts from reporting operators showed a decrease of 8%. Reporting attraction operators showed a decrease in gate receipts of 8% in 2016. Golf operators, however, recorded another strong annual increase in rounds played – up 8%. Despite an encouraging start to the winter with cold temperatures early in the season, the weather turned warm in mid-February and stayed warm into March. Toronto, where many of the region’s visitors live, recorded the warmest February in 80 years and the warmest February day ever, with the mercury topping 18 degrees on February 23, 2017. The unseasonably warm weather means the winter pursuits we promote had fallen off the agenda for many in our target audience. Notwithstanding these temperatures, accommodation data for the winter quarter shows a strong increase in occupancy.